Throughout the ages was much experienced, many pains, many struggles, many challenges that reached them at the core of his being. They are pains that bring with you to cleanse, experience and release. All this causes great confusion in your beings, because you bring experiences that lead you to incomprehensible emotions in this life. Some experiences function as "triggers" to bring energy from ancient eras to you. Then, in simple experiences of your day, you end up experiencing deep pains in your soul, which your rational mind is not able to aid you in understanding. The answer to these pains will be in your heart, in your soul. This is especially true for you, Workers, Bearers, Anchorers of Light, for you have always been drawn into dense situations, where you entered these familiar and social environments with the function of dissolving density and replacing it with a new, more enlightened mode. But they were not always successful in this purpose, for you entered these environments and often involved them, forcing them to lose their naturalness. You entered a character and assumed that persona contrary to your being. This caused them many pains, hard confrontations. But many times, and in most of them, you were extremely successful, because the "failure" in one situation was what led to success in countless others. For there was an earlier learning to sustain them. And so it was, experiencing these experiences, which often appear in this now as deep pains, as illusions of other ages that were engraved in his soul. As something that simply takes them from their center to divert them from the path of the Heart, without a logical explanation for it. But often these deep pains lead you to lower behaviors, where in an attempt to rise, to show that you have overcome that pain, you unconsciously stand in a position of superiority. But there will always be a pain of the soul to be faced and never a reason to try to manifest in superiority to anyone. When this pain kills you, you must experience it. You feel it, accept it and go, day after day, overcoming those inner traumas that have been marked on your bodies. Then you clash with these "triggers" that again awakens you to the inner experience of these accumulated ancient energies, but you place yourself in a position of respect for the Divinity of all those who undergo this same inner process. You know, My Children, as we look inwardly, as we feel our weaknesses, there is no need to put ourselves in a position of superiority. This is a vain attempt to stifle our pain and not allow it to appear in a form of inner weakness. To put ourselves in a position of superiority, in truth, we are revealing our deepest fears. This attempt will again create a rejection of our beings and accentuate our own inner pain, evidencing that which remains in our soul, but which we try to suppress it with a manifestation, often, of arrogance. But if, on the contrary, we experience these experiences and put ourselves in a position of equality, knowing that there is a pain in that our brother that also takes it out of the state of perfection, we feel and without fear we are working these energies in our interior, with humility, recognizing the Divinity in every human being. So God's love envelops us, enabling understanding and gentleness, putting us in step with what in us needs to be adjusted to a true frequency and in line with what we really are. In a place that we no longer need to go ahead with a "flashy" to us, as if "Hey, look at me, I'm here", but that this is in a natural way, by the Light that radiates from us and, without any pretension to be more than in reality we are all in the same line, in the same degree. And let the pain, the pain of ages, the pain of times be dissolved in the simplicity of simply exercising our role as beings of anchoring. No more, no less, because that is the way. Because that is the way. 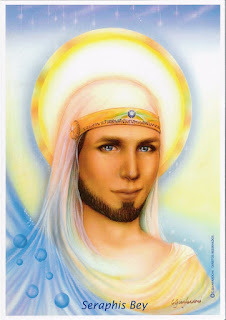 I am Serapis Bey and I come here today because I honor each one of you, respecting you and loving you for absolutely everything you represent. May the love of God always be in your hearts.